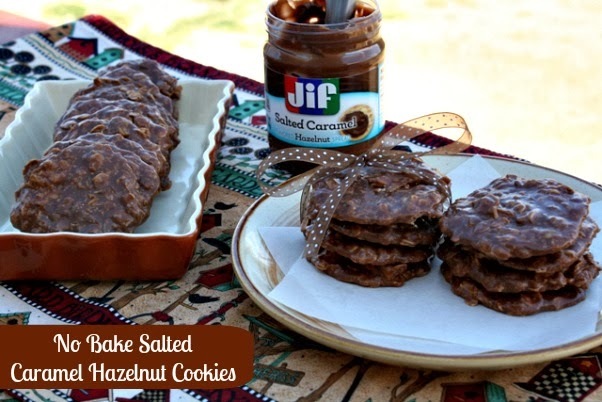 Chocolate Peanut Butter No Bake Cookies are on the top of my favorite cookie list. I'm a bit of a Cookie Monster, so I try not to make cookies too often, but no bake cookies are always hard to resist. No bake cookies are an old fashioned recipe, and probably why I love them so much. They're made with pantry staple ingredients that I always have on hand. Awhile back I received a jar of the new Jif Salted Caramel Hazel Nut Spread in the mail. It's been sitting in my pantry for about a month now, and I haven't even opened it (I know hard to believe). Well a couple days ago my daughter opened it and ever since then we haven't been able to keep our spoons out of it. We almost polished off the whole jar before I thought about using it to make these tasty cookies. 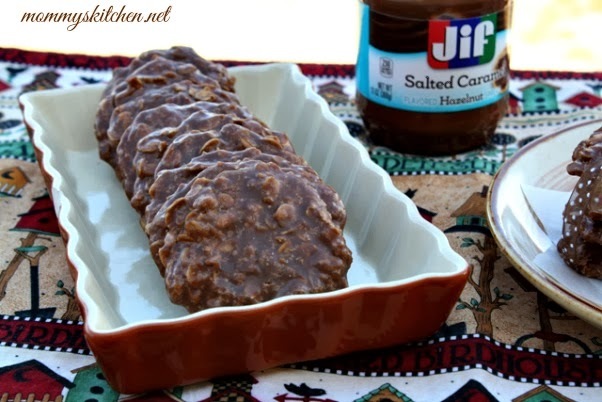 As soon as I got my first taste I knew instantly that this salted caramel spread would make the best no bake cookie. 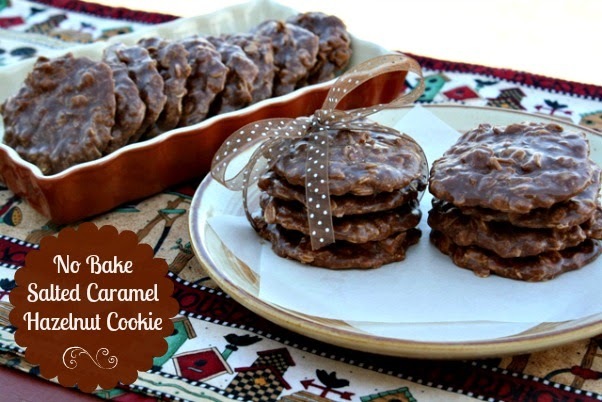 No bake cookies can be tricky to make and several people have a hard time making them. The key to making successful no bake cookies, is to boil the mixture for the perfect amount of time. Boiling the mixture too long and the cookies can become dry and crumbly. If you don'tboil them long enough the cookies won't set up. I have found that boiling the sugar mixture for exactly 1 minute and 15 seconds seems to be the happy spot. Weather can also play a role in your cookies setting up. Make sure it's a dry day and not a humid one, because these cookies don't take a liking to humidity. Chocolate no bake cookies are a lot like making candy and are very sensitive to humidity. 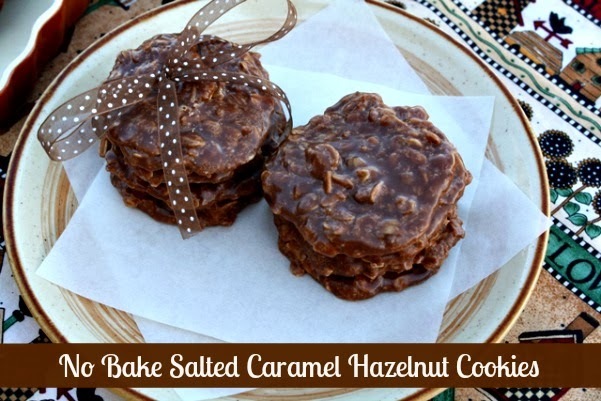 Now that I have discovered no bake cookies with salted caramel there's no looking back! In fact I need to pick up a jar when I head to the grocery store, because it's due time for another batch. Let's get started and make some cookies! In a medium sized sauce pan over medium high heat add butter, sugar, cocoa powder or chocolate squares, milk and salt. Stir until butter is melted and ingredients are incorporated. Bring the mixture to a full rolling boil. Reduce heat to medium high and continue with a light - medium boil for 1 minute and 15 seconds, stirring constantly. Remove from heat and using a wooden spoon stir in chocolate salted caramel hazelnut spread, vanilla and oatmeal, mix well. Working quickly before the mixture cools scoop by tablespoons onto wax paper or foil. Let cool completely then remove once the cookies have set up. In a medium sized sauce pan over medium high heat add butter, sugar, cocoa powder or chocolate squares, milk and salt. Stir until butter is melted and ingredients are incorporated. Bring the mixture to a full rolling boil. Reduce heat to medium and continue with a light - medium boil for 1 minute and 15 seconds, stirring constantly. Remove from heat and using a wooden spoon stir in chocolate hazelnut spread, vanilla and oatmeal, mix well. Working quickly before the mixture cools scoop by tablespoons onto wax paper or foil. Let cool completely then remove once the cookies have set up. Cook's Note: The cookies get their shiny gloss from not touching or disturbing the cookies once you have dropped them on wax or foil. Also 2 - (1 oz) squares unsweetened Bakers chocolate can be substituted for unsweetened cocoa powder. Yum - these could easily be my new addiction too! Yummmmmm. Some of the best cookies ever invented. Oh Yum. 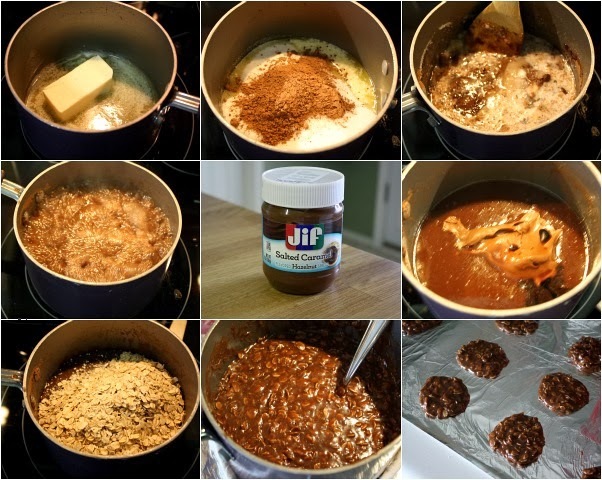 I luv no bake cookies and will be adding the Jif Spread in my next batch for sure. I'm going have to check my jar to see if I have enough to mix up a batch today. These cookies sure are addictive. I just made up a batch of these goodies. All I had was the Hazelnut chocolate so used it up what I had left along with a little coconut left in the package so got rid of it as well. Pretty good with the coconut mixed in. I made some. My daughters loved them. I m so happy when they love my cooking. Thanks for sharing nice & easy recipe. I have always used quick cooking oats for my no bakes. I will try them with old fashioned oats with nutella and see what happens. Thanks for the post. If I plan it just right, maybe everyone will be gone when I make these. Lol They really look good. Can't wait to taste one. Can I use Nutella Hazelnut chocolate spread instead of Jiff? I always use my double boiler to make this kind of cookie. It is much easier to control the heat to keep from overcooking. I've never had a batch fail in the double boiler. Does anyone know if you can substitute splenda sugar blend or a stevia blend for the 2 cups of sugar? would love to cut some of the calories! Looks like a shopping trip to the US is in order again! Did you use cocoa or Baker's chocolate squares? They look too good to eat....(said no one ever). woops....I sure said that sentence WRONG.....it's suppose to say "that doesn't look good enough to eat....said no one ever. I'm not all here this afternoon. These are delicious. The only thing I didn't have on had was the Salted Caramel Hazelnut spread... needless to say it went on the shopping list. We have made one full batch and then two half batches in the last three weeks.... oh my the flavors just meld together so nicely and I can pretend it is healthy because it has oatmeal in it! Can these be frozen after they set up? They look amazing! Because I do not want to screw this up, do you have to cook the oatmeal first? The oatmeal is not cooked in this recipe. You just add it into the sugar and cocoa mixture after it has cooked. Just made these with crushed-up plain granola, almond milk, and Smart Balance as substitutes, and they came out great! Thanks for the recipe! I made these tonight. They are good. However, they are extremely rich! How do I prevent that grainy texture? I've swooned and just picked myself up off the floor! =D These look and sound amazing. Pinning! These are very delicious. I too am from Canada and had my husband buy some of the Jif Salted Caramel while he was travelling in the States. When I was reading the label, it says it is a product of Canada! Did I say these were very delicious? I want to try this without the oatmeal as an ice cream topping. They would really be good Puffed Wheat squares too. Utterly devastated, Jif is no longer making the completely yummy Jif Hazelnut Salted Caramel Chocolate spread. Regular chocolate or nutella just don't do it after the Hazelnut salted Caramel.